The reason for this is because the GE Circleville, OH factory that made slimline and HO lamps no longer exist. 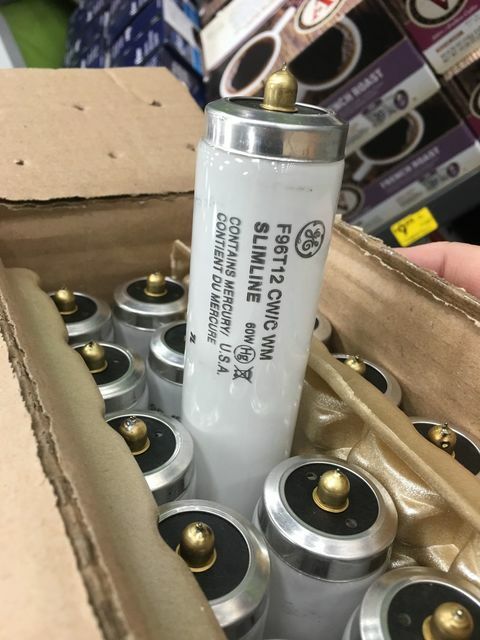 GE now only makes bipin fluorescent lamps at Bucyrus, Ohio. The irony, this is a 60w Watt-Miser. Philips no longer manufactures T12 Econowatts. Look like sign of GE going down the tube. Nobody is putting in new installations of 8' T12 in the commercial or industrial sector, Ide imagine that the sales of 8' T12 has also decreased significantly in the home improvement stores as well. GE made the smart decision of just rebranding lamps made by a different manufacturer as to still satisfy the small and ever-decreasing demand of these lamps for those who are relamping existing fixtures, while eliminating the costs and liability of owning the plant that makes them. Ive seen this in the late 80's in a west-point stevens factory. There were philips made GE labeled F96T12/CW/HO lamps in that factory. I also have a case of GE made Philips F96T12/ultralume 35/EW lamps. At least they are USA made. 3600 lumens for an 8' slimline is pathetic. There are F40 lamps that make 3600 lumens. 8 foot Slimlines are just to long and difficult to store and to install and dispose of. Its a wonder there is still enough demand for them in this day that production is still possible. F96T12 are not difficult to store or maintain. Sounds like you want them to disappear. I for one love the ease of maintaining these. Lamps removed from fixture meant power was disconnected from ballast. I could remove both lamps from twin lamp strip with one hand at the same time. Also put both new lamps in at the same time. These crappy f32t8's nearly double relamp time. F32T8 was introduced in the early 80's but it took government forcing them on people and deceiving them about T12 lamps for them to become mainstream. T8 is a scam. I'll be honest with you, i've never shared any particular interest in 8 foot slimlines but don't get me wrong, I don't want them to go away because they are an old tried and true technology and when cared for they give excellent service. I would like to keep seeing them around. Im just saying because the T8s are killing them, its surprising to see they are still made today but thats a good thing. Personally in my situation right now, i just don't have the room for long tubes. Not while I'm still living at home and confined to the basement for storage. Once I move out and have a whole house to myself I'll take in more slimlines. I would like to have some F48s but those are rare here. So far I have 2 daylight 75w sylvania lamps and a 8 foot louver fixture. Do to space issues, it has to be stored on the ceiling disconnected with lamps in it. Lastly any business that has F96T12s and dumbs them down to F32T8 is wasting their money. If you must save energy, keep the fixtures and just user F96T8. They save a few watts compared to 4xF32T8. A corner store down the street from me has slimline industrial fixtures throughout and the owner kept them and changed them to F96T8 only. I wouldn't mind if they said farewell to 60w F96's once and for all...infact that'd be good riddance. Even GE nixed them now? Philips did a few years ago. I still have lots of the full mercury versions. They lasted just about forever. '90s-'00s GE lamps were second to none in terms of quality. I hope to find more full wattage vintage F96T12 bulbs, preferably cool white ones. I have a General Electric one from 1982 that gets used a lot, and is still going. My grandfather bought that one new, so it has been in the family a long time. If i would like to see something go away it would f32t8 and led retrofit lamps. Those are two things I would say good riddance to. I miss going out and seeing a ceiling full slimlines. I kinda don't blame you. I admittedly use both and the LEDs are attractive to me only because back home I'm off grid so watts do count. With that said, though, I can tell you that around here there were never any power company changeout rebates; I know of lots of places still lit by slimlines even within walking distance of the house I'm currently living in. With that said, all the box stores are lit with those 6 lamp T8 highbays with LED tubes by now. My biggest gripe about the electronic ballasts (besides the comparatively short life!) is the horrible hash they make on the radio. Back home there are multiple fixtures I cannot have on most of the time. Luckily, in places like my shop I have so many other magnetically ballasted fixtures or other types of light sources that I can simply avoid using those fixtures.